Born in Peace River Alberta, Kelly Kisio moved with his family to Wetaskiwin in 1962 when he was three years old. Kelly grew up playing all sports; hockey, fastball, volleyball, basketball and football. He competed through all age levels in the Wetaskiwin Minor Hockey and Minor Fastball systems. Kelly’s fastball teams won several championships and one year Kelly won the Batting Title. However, even as a youngster, Kelly’s main aspiration was to become a professional hockey player and play in the NHL. He practiced and trained to attain this goal. Kelly was an inspiration to his teammates and his display of heart and desire plus a quick shot and good skating led to many game winning goals. Kelly’s innate ability and value to teams was apparent to Wetaskiwin coaches and when he was at the bantam level he played part of a season with the midget Kings and in his second year as a midget was on loan to the juveniles. According to a 1980 Wetaskiwin Times article, Kelly was a coach’s hockey player, he always listened well. 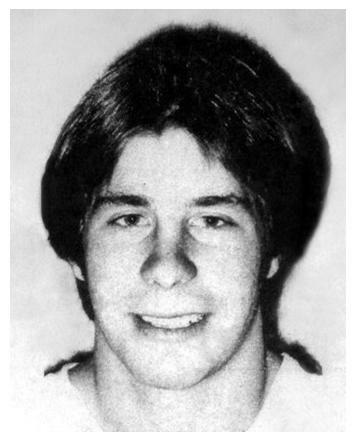 At age 17 Kelly continued pursuing his hockey career and played Junior Hockey for two years with the Red Deer Rustlers where he had 54 goals and 101 points the first year (1976-77) and was named an All Star for scoring 74 goals and 142 points in his final year (1977-78). The next two years (1978-79, 1979-80), Kelly starred with the Calgary Wranglers of the WHL where he led his team in scoring and reached consecutive 60 goal seasons. He was named WHL Rookie of the Year for 1978-79. 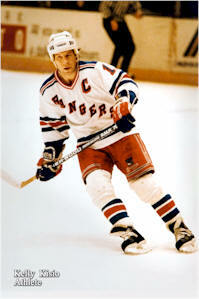 Also, in his rookie year, in recognition of his leadership qualities Kelly was appointed captain of the Wranglers. Kelly entered pro hockey as a free agent in 1980-81 and was an effective player with the Adirondack Red Wings of the AHL and the IHL’s Kalamazoo Wings. In 1981-82 Kelly scored 62 goals for the CHL Dallas Black Hawks. 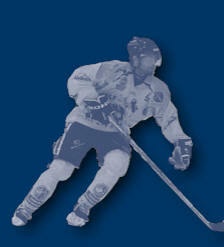 In 1982-83 Kelly headed overseas to play for the HC Davos Club in Switzerland and scored 49 times in 40 matches. Voted by the Fans as a “New York Ranger Fan Favourite"
The Detroit Red Wings signed Kelly as a free agent on March 2, 1983. Kelly recorded three straight 60 point seasons (1982-86) in Detroit before he was traded to the New York Rangers. In his five years in New York (1986-91) Kelly recorded five straight 20 goal seasons and averaged nearly 70 points per season. As well, Kelly’s leadership abilities were again recognized as he served as the team’s well respected captain for three and a half seasons. Kelly was voted by the fans as a “New York Ranger Fan Favourite”. A new challenge awaited the veteran pivot in 1991-92 when Kelly ended up as one of the team leaders on the expansion San Jose Sharks. That year Kelly battled injuries and played only 48 games but still managed 37 points. The next year Kelly led his team in scoring and tied a career high in goals (26) and points (78). He was voted by the media as “Sharks Player of the Year” and represented the Sharks in the 1993 All Star Game in Montreal. Both seasons Kelly served as assistant captain of the Sharks. In 1993 Kelly returned to Alberta when he signed as a free agent with the Calgary Flames. He contributed defensive play and leadership to the powerful Flames before retiring in 1995. During his 13 year NHL career, Kelly played a total of 761 games and he posted 658 points on 229 goals and 429 assists. Kelly’s play combined speed, great hockey sense and an unselfish attitude; he was always much more than a one-dimensional player. It was versatility that made Kelly the competitor he was. After retiring from playing, Kelly joined the Calgary Flames scouting staff until the 1998–99 season when he was named General Manager of the Calgary Hitmen Junior Hockey Club, who are owned by the Flames. With Kisio as GM, the Hitmen have made the playoffs every year, won two central division titles, and won the Western Hockey League title in 1999. During the 2003-04 and 2008-09 seasons Kelly was awarded the Lloyd Saunders Memorial Trophy give to the WHL’s Top Executive. He was runner-up for this award in 2007-08. Kelly Kisio has been an inspiration and role model to the young people of Wetaskiwin. 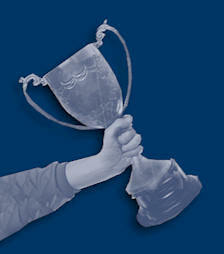 Each year at Queen Elizabeth Junior High School, the top male and female athlete are awarded the “Kelly Kisio” trophy. We salute his achievements and exemplary hockey career by inducting Kelly into the Wetaskiwin and County Sports Hall of Fame.